This one is going down a day late and a dollar short, but I have been busy, and I did not get it finished on time. 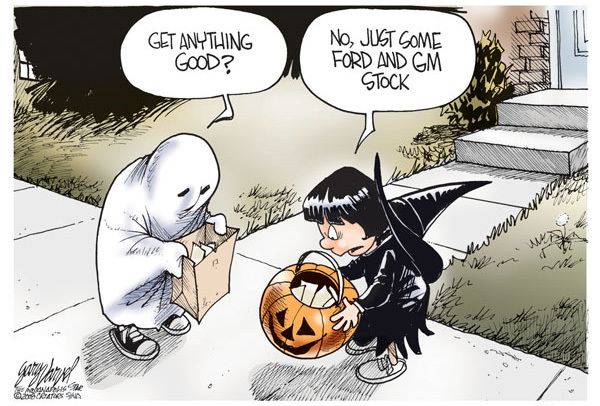 Here is your Halloween Joke for 2008. An extremely modest man was in the hospital for a series of tests, the last of which had left his bodily systems extremely upset. To say that he had “irritated bowel symptom” would be an understatement to say the least. Upon making several false alarm trips to the bathroom, he decided the latest episode was another and stayed put. He suddenly filled his bed with diarrhea and was embarrassed beyond his ability to remain rational! In a complete loss of composure he jumped out of bed, gathered up the bed sheets, and threw them out the hospital window. Any bets on what happened to the doorbell after that? When he went out into the dark and told ALL of his little buddies? This entry was posted in humor, Oklahoma, random, Recent, Uncategorized and tagged Candy, Drunks, Full Moon, ghosts, goblins, Halloween, Hospitals, kids, Security Guards, Sheets. Bookmark the permalink.